I’ll try. I’ll try my best to put down into words what was the longest and most incredible run of my life. What it all kind of means. 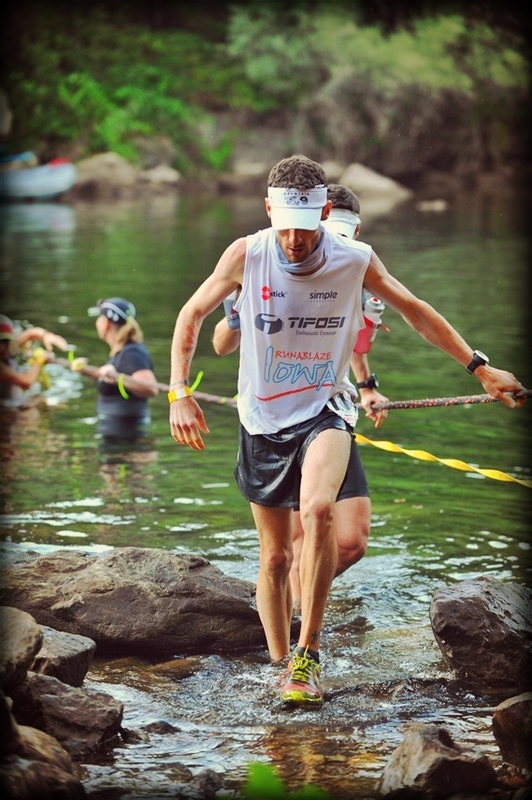 I’ve previewed this as being my last highly trained competitive race (more here) and none of it has quite hit me yet. This retelling won’t be what “it” really was, but I’ll give it my best shot to bring you along with me into the mountains, into the canyons, into my brain, into what I felt that sunny Saturday in California. I could write of my training through the harsh Iowa winter and playing “chicken” with some Achilles tendon irritation. Trust me, the running geek in me could go on and on about heart rate zones and the intricacies of my workouts and what skill-set I was working (or neglecting) each day / week / month. But I want to give you more … and you should want more than hill repeats, spreadsheets, the most detailed of splits, and what shoes & socks I wore. You should want the full truth; the deepest truth. And so I’ll give it to you one last time. The truth about the real reasons I made it from Squaw to Auburn in one piece is found in the God I serve and the people that served me. That’s it, plain and simple. Please grab something to drink and make yourself comfortable as this may take a while, but this God and these people are incredible and deserve to be woven through my story. 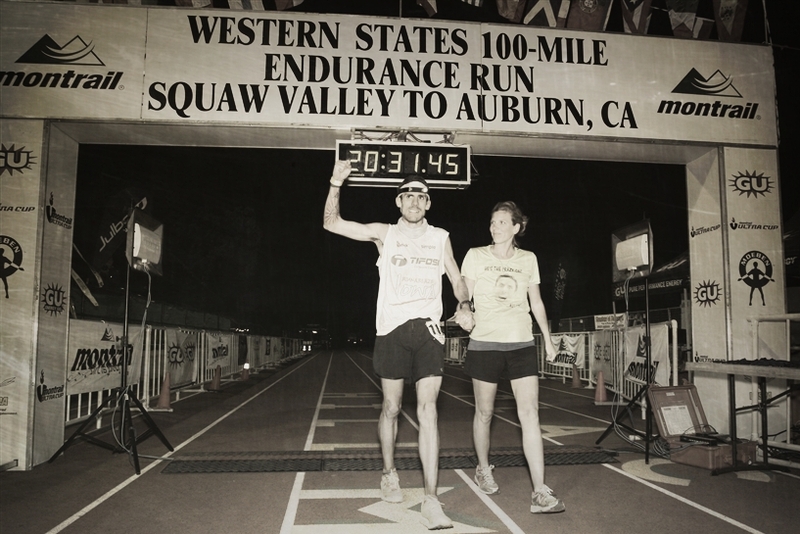 The journey to the finish line in Auburn started much earlier than the starting line in Squaw Valley. Very cute and cliche, I know, but it’s true. It started before I checked my phone last December and realized my (lucky) entry into this prestigious race. It even started before I ran my first running race in 8th grade. This journey started in the Rocky Mountains outside of Golden, Colorado when a young skinny 8-year-old boy would ride his bike to church…. He told his mom and dad to meet him there as he would bike UP UP UP the 1-mile dirt road from their private log-house and onto a few more miles of highway arriving dirty and sweaty. This boy was me and his parents were my parents. Especially my dad had already seen my love of the bike following his love of the bike. He rode through the mountains of Colorado and taught me of the Red Zinger, Greg Lemond, the Tour de France, and the like. I rode to church with nothing but tiny boy-sized spandex, a t-shirt, and helmet with a hand-sized Bible in my saddle-bag. One Sunday they must have “noticed” I truly was only wearing spandex … no undies, but no chamois either. Hey, Greg Lemond didn’t wear undies, my dad didn’t wear undies, Andy Hampston didn’t wear undies, so I didn’t wear undies …. to church. We had a chat and figured all of that out, but needless to say I was hooked and followed my dad’s instruction about what it means to make your legs and lungs hurt on the bike for a few more years even while we moved back to the Midwest. With minimal opportunities as a 10-year-old in Wisconsin riding a road bike around my block (even seeing Greg Lemond pull up to a neighbors house once for a ride in La Crosse) and my friends out for cross country, I began to run. And run I did. Our trip started out with one of the weirdest disagreements / arguments my wife and I have ever had and moved into the most tender of moments as we waited for our plane to arrive at the gate in Cedar Rapids. I’ll spare you all the details but one way or another I was able to surprise her with the gender of our third child due in October (I knew, she didn’t … don’t try to figure it out, we’re weird). And a surprise it was, a baby girl due in October … I would be leaving the boys in Iowa with their grandparents and taking my girls to California. Our airport glee of (happy) tears and laughs quickly turned to boredom in MSP as our flight to SFO was delayed by a few hours. At least we had the company of my sister and brother-in-law (also leaving their kids with a different pair of grandparents) and the opportunity to … well, sit and chat … then sit more … chat more … strroooolllll around the airport … then more sitting. And before you knew it we were in SFO all loaded up on the rental car flying down the freeway …… and shortly thereafter stuck in traffic at midnight crossing the Bay Bridge for some twilight construction. My brother-in-law Matt was all hopped up on coffee and got us to our Lake Tahoe resort ~4am (6am in our brains) where my parents were already fast asleep … time for bed. The next two days of pre-race activities went swimmingly … low-key walks by Lake Tahoe, some light jogging, packing up gear, naps, mini-golf, gear-checks, excellent meals with the family, more gear packing, team meetings, gear-check, gear-check, running gear-check, and incredible company … also, quite of bit of gear-checking / packing / repacking. I did not finish (DNF) my first high school cross country race. A stupid and ignorant freshman I had missed our team time trial beforehand and had no idea what kind of pace, comfort, or pain I should expect in a 5k cross country race until I ran the junior varsity invitational in Verona, WI. Dizzy and full of stomach cramps I called it a day and came away from the day being none-the-more-wiser and confused. Fast forward to my very last high school cross country race; I didn’t DNF but I didn’t “finish”, as in, I didn’t finish very strong. After winning the conference and sectional meets I found myself a bit dead-legged and suffered through the final mile in the Division 1 Wisconsin State Meet. Being our team’s senior leader I was now our 5th runner as we were only 9 team points outside of a state championship … if I would have run 10 seconds faster we would have brought home a gold trophy instead of silver. There was no “next year” to remove this very bitter-sweet taste. A note on time management. Some ask me how I could ever be out there that long and I try to compare driving across the country for a 10 hour stretch with being stuck in 3 hours of stand still traffic. Which seems longer? Which is more fun? When I get up and run at 4 to 5am on the concrete sidewalks of Iowa I have podcasts and music waking me up 90% of the time to engage my brain and avoid boredom. 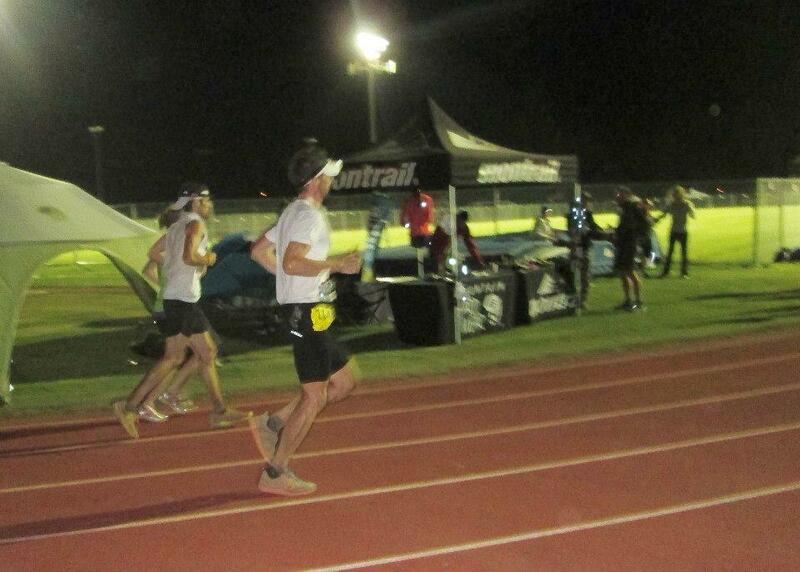 In the 20+ hours I ran at Western States I listened to ~12 minutes of music and really shouldn’t have even started. When I feel good and am enjoying the scenery and “nature” soundtrack the hours fly by … when I feel bad and am struggling, the last thing I want is to be overstimulated. I found the same to be true on my 12-hour Grand Canyon run – never touched the iPod. Ok, back to the high-country. The only hic-up I realized was that my heart rate monitor strap wasn’t working (dead or not linked to my watch) and I all of a sudden realized I forgot BodyGlide (or Vaseline) or tape for any kind of chaffing … none, zero, nothing. Mental note for when I see the crew. Speaking of my crew, I was thinking of my first “backwoods” crew (Duncan / Dusty aid stations) of my wife Alicia, her brother Joel, and his wife Dusti and if they’d made it according to the maps / directions. 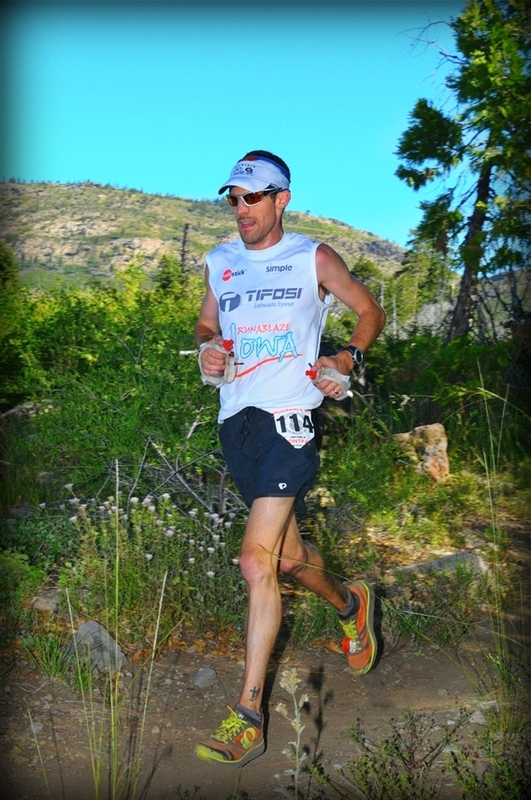 I saw them right on time at Duncan AS and felt great … a bit of tape, petroleum jelly, bottle refills, and I was out. During my team meetings I expressed to all of my crew that I wouldn’t be able to thank them enough with how I felt about them being there in person without losing it or stumbling over what was truly on my heart so I wrote them letters and they each opened them at different aid stations. On my climb out of Duncan to Robinson Flat – the longest and rockiest climb of the day – I thought of my dad a lot, about him being my first and only hero, some ways I still need to grow to maturity like him, and the fact my grandma (his mom) passed last year on Western States Race Day as I crewed Joe. Up the climb I continued and I felt energized into Robinson to see my family and where I was first weighed. It’s completely normal to lose ~4% of your body weight over the course of the race and there are certain medical check points to see if you’re within this metric for your safety from dehydration and hyponatremia (too much water / salt is diluted). I was already down 3.5% (138-ish lbs I think) and scarfed a lot of watermelon and oranges before heading to where my mom, dad, sister, and brother-in-law Matt were set. Refill on the bottles and unsuccessfully try to change out the heart rate strap battery before I was running out. Hiking out alone to finish that long climb is tough after just seeing everybody so excited at the largest aid station in the high country, but I mustered on … until … rumble rumble. RUMBLE … gag gag rumble … must’ve been too much watermelon, Cliff Bloks, and who knows what else all at once. After three stomach-wrenching puking yaks I was free and clear of what I had just put in to my system. Good news is my stomach recovered and felt amazing (as it always does after you puke), but bad news is I was heading into the days first heat and open canyon trails a bit depleted and low on calories. Settling down I ran down Little Bald Mountain pretty easy and just took it really easy to the next aid station, switched to Tailwind (liquid calorie / electolite mix) in one bottle, and kept eating what solids I could (and ginger candy for my stomach) at the aid stations. Feeling regular again I was moving well but still very tentative about pushing these long gradual down hills before the real canyons set in … I was fine with floating around 35-40th place as long as I was guaranteed to not blow out my quads early (or at all). Being caught by Monkey Boy Scott Wolfe (11th place last year) and reeling in local elite / favorite Dan Barger I was in good company and feeling great. Thinking of my crew again approaching Dusty Corners Aid Station I was pushed along by my sister-in-law Dusti and what she’s endured in her own life. In this I was happy and thinking of how our lives had been joined by both marrying into a fun / crazy family and how happy I am that my best friend found her to marry. Continuing to feel relaxed and conservative I approached the Last Chance AS feeling great and continued filling 40oz worth of fluids and eating solids to some degree. My running stride was efficient and great all day on the gradual down / up grades but upon plunging into the dozens of STEEP switchbacks into Deadwood Canyon I again relented to pretty conservative and slow plotting downhill running and then power-hiking up the other side up the steepest sustained grade of the whole day. Especially thankful I saw these canyons five weeks prior but things are always a bit different on race-day – more miles under (and ahead of) the legs, different weather, etc – and I was just looking at getting through, surviving, and having legs to run afterwards. What a relief seeing Joe serving others at Devil’s Thumb as he helped me with sponge-over-the-head, refill bottles, and Vaseline … check that, he helped me FIND the Vaseline, I took the reigns on that one. More getting passed by a few familiar faces (Barger, AJW, etc) on my way to Eldorado Canyon and the hiking / running up to Michigan Bluff was longer but more pleasant than Deadwood being able to get in some good rhythm and get excited for who would be waiting for me at Michigan Bluff – the quartet of my parents, my sister, and her husband Matt again. I thought to myself, “This is Western States” … I’m nowhere near the finish, but have a good 10 hours into my day, and it’s (kind of) hot. I couldn’t see the top of the hill even when coming upon the multiple false-crests. What a sight it was to get off the trail and run strong into the mountain town of Michigan Bluff seeing my dad with his camera and showing my crew I still have running legs!!! PS – If you even once think about slapping me in the crotch during this race I will repay it 1,000,000 times back to you when I get my strength back. Excited to get through this last canyon – Volocano Canyon and onto Forresthill I was moving pretty well and starting to mentally and physically detach from the canyons. I could taste the next section and mentally was licking my chops to settle into a better running stride despite being on my feet for almost 12 hours now. There is a ~0.5 mile steady incline on Bath Road which takes you to the main Forresthill straightaway into the next aid station … during training camp I remember rolling my eyes at Joe making me trot and not walk as long as my heart rate was under 160. On race day I ran the whole thing knowing that my first pacer, best man, and best friend Joel would be at the top waiting. Upon arrival we chatted and it was like old times … just out for a run. I caught him up on how I was feeling and my excitement to get out of the canyons and actually run down some folks and he assured me he was ready to give / take anything in and around the aid station. And so we approached the largest aid station together with even more crew awaiting us on the other side. I was weighed again – still down weight almost all day hovering around 136-138 lbs (3.5-5% down) and grazed on some oranges as bottles were refilled. My now-even-larger-combined crew was waiting for me and among them my only sibling. My dear older sister is one I can’t describe without wanting to just stop and have everybody that will ever read this go out to coffee with her, sit with her, and have her encourage you. Allow her to be selfless and gentle and giving and quiet and humble with you and only then you might know of her what I know of her. “…It hasn’t been until recently when I became a dad that I can appreciate the natural abilities and gifting you have being a mom to your girls. What a joy it is to be a part of it … I love being Uncle Sweaty!!! (Uncle VERY Sweaty today). This was the first time I had everybody in one place and it felt great. To be honest, looking back (and talking with Dusti and Alicia later) I was probably in worse shape at Forresthill than I realized. My mind was in good spirits and I felt my body respond well to running anything run-able but there probably should’ve been more attention to fluids and calories even here to prevent some difficult miles ahead. Mind, good … muscles, good … energy / calories, to be determined. 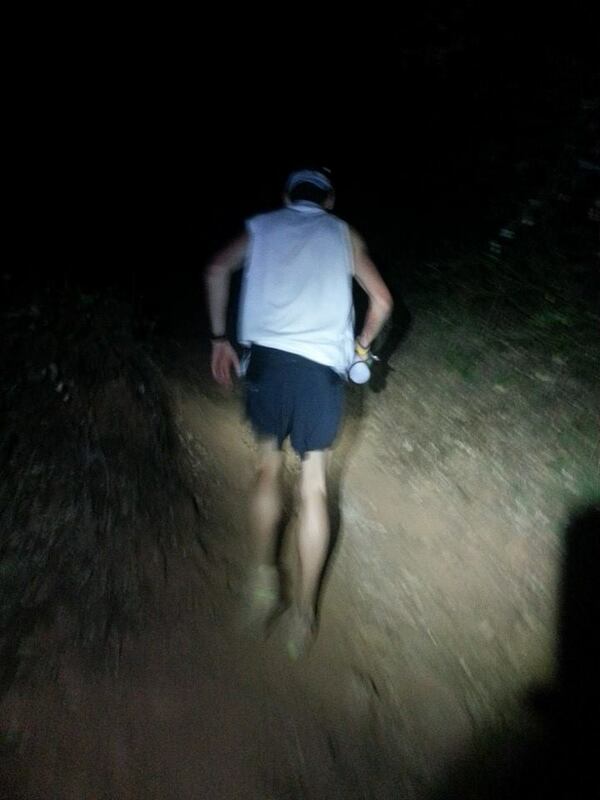 Finally on the road with my first pacer … Joel is somebody I cannot begin to describe only in words. A full dance-contest, rap-battle, karaoke machine, and full powerpoint presentation regarding dozens of thrifty ways to save money (including entering a legit boxing match to avoid paying a cover charge at a particular bar) would be a bare minimum required to understand this guy and why he’s been a brother of mine even before I asked to marry his sister. He ran behind me on some of the most gorgeous single-track trails the day had to offer. A lot of short and sweet up-downs in the first 6-7 miles had me all out of sorts with rhythm and couldn’t get into that gear I thought would click so easy. I had been waiting to run quick all day and this is where I’m still being passed? Can’t be … gotta get to that middle aid station (Cal-2) and get fixed. I was drinking fine but time was ticking and I was getting even more behind on calories and fluids. After Cal-2 all seemed on the upswing as I got into a nice rhythm, took another salt pill (couldn’t remember the last time I did that) and peed neon yellow (my first pee in a LOOONNNNGGGGG time – probably 40 miles). Not a bad pee color but it burned, probably pretty acidic but at the time I was just happy I peed. Walking up 6-minute hill was of course treacherous but again I could feel my body want more running terrain … my legs wanted to run! Bottoming out after Cal-3 we did just that and put in probably a good 30-40 minute block of running before being interrupted with another hike along the river road. When I ran, I was (seemingly) fine but stopping brought my whole system to a hault. I just could not get it going again. When I was running I wanted to keep running … when needing to stop / hike my body wanted to remain stopped. Talking about it later, Joel was noticing my motor skills being compromised (adjusting my shorts & using my hands in seemingly slow motion) and my speech becoming slower and slurred. I knew things weren’t great but this low-patch didn’t hit me until I arrived at the river, weighed in at 135.x (over 5-6% down) and stopped in front of the aid station table hands-on-knees. Walking … grab the bottles … hobble down to the cable-line … in good enough spirits to run an “Unbreakable” quote by Joe in front of the same aid station worker in the movie (whom I might’ve offended) – “WE’VE BEEN WAITIN’ FOR YA HAAALLLLLLL” … and dip into the coldness that is the American River. Everything within me wished I was there 2 hours prior and hadn’t cooled down yet so it would feel fresh and cool instead of damp and icy-cold. Forgetting to acknowledge and wave back to my family on the far side, we trudged on up the road towards Green Gate. Walking part of the road I was downing Coke, water, and more Coke. I could already feel my brain wake up as I filled Joe in with the days happenings … legs have been fine all day, been ~3-4% down all day, puked on Little Bald, hated Cal-1 to Cal-2, and now I’m here nice and depleted. He quickly took any alertness queues I gave him and had me running 70% of the upper half of the road … we were at Green Gate (and up on weight!) before I could finish my somewhat-crude very-inside joke about MLD which I think gave us both the laugh of the day. A bit dizzy with the shots of caffeine, I switched to Sprite for the rest of my time on the Western States trail and was running down the trail in no time being serenated to whatever bubble-gum pop song Joe had up his sleeve. A bit of yo-yo-ing (passing / re-passing) with Denise Bourassa I was moving great before finally putting on the headlamp. This was going to be it!!! Back from the dead to truly pick up some carnage and hammer the last 16-17 miles! “The pace / intensity you’re running now, you should take a couple of those Bloks you have and put them in your lip – don’t swallow.” said Joe – the perfect advice as I was almost finished with my Sprite. Being somewhat delirious after having run almost 85 miles and being a creature of habit I quickly took two Bloks, chewed them for two seconds and gag’ed them down into my stomach. Run run run for 10-15 more seconds before …. BOOM …. REJECTION …. hands-on-knees stomach-emptying puking for a while before continuing on down the trail. 10-15 more minutes of running without fueling (and passing Nick Clark walking with the BGD) and rejecting a lot I had just refueled with lent me to enter an even lower rough-patch at ALT – weighing in ~135ish again. Not feeling like I could swallow anything, I eventually got some crackers and chicken broth down and walked out carrying two full cups of broth and bottles just as I saw Nick ask for a chair to sit in coming into ALT. I knew I would finish … if Nick wasn’t finished I wasn’t either. The next 2.5 miles was a walk and/or power-hike through the woods, getting the broth / crackers down, some good prayer between pacer & runner, and laughing at every bit of UW-Eau Claire history, folklore, and stories Joe could muster. My spirits were definitely up and when my body caught up (once again) on energy / calories I found myself running / trotting again in and out of Brown’s Bar … 10 miles left!!! A painful descent spit us out onto the road before we met up with another runner … wait, the Aussie David Eadie I climbed the Escarpment with 88 miles prior!! I knew my family was only 1-2 miles away at their last aid station before the finish, probably wondering if I dropped somewhere and I wanted to reassure them I was moving well and on my way. I attacked the climb with my best power-hiking yet before being fully capable of running away from another intruder a mile out from the aid station. Joe was already priming me for the last miles and having me race these guys … so I had two main low patches, am I still in the race or not??? Let’s roll, get going and drop this guy before he even gets to the aid station. Burning up the last bit of trail. Photo courtesy of Joe Uhan. It’s incredible what the thought of two boys 2000+ miles away sleeping like the babies they are can do to you when you’re exhausted in the woods with only 5 ounces of Sprite and a headlamp. We charged up towards Robie Point passing another couple runners on the way and I reminded Joe as he urged on more aggression “If I’m close to somebody in the final mile, I’m not going to battle. I want to run in with Alicia.” He understood, but as we crested onto the 99 mile marker and got passed by Eadie for the final time he reminded me the crew could still be 3/4mile away and to “give it hard” to the other 2-3 runners we passed only minutes before. Eager to be done I ran. I ran the whole way and just wanted out … out of these shoes, out of the trail, out from under this burden. I recognized Matt and Joel a couple blocks out and as I approached the track saw my honey standing and waiting … “let’s go” I motioned to her in which she and that cute little baby bump followed me through the gate to the lights of the Placer County High School track. What I remember of the blur of the track is that it felt very wide and very bright. There was more light than I’d seen since I hugged my mom at the river crossing before the sun went down. Tropical John announced my entrance and I remember making Joe laugh one last time with the mention of double decker tacos booming over the PA.
On the track is Adam Condit from Cedar Rapids, IA … a systems engineer. Adam enjoys playing with his two sons and striving to serve his wife … and more importantly his favorite anytime meal is double decker tacos and oatmeal stout. He is being paced by none other than Olive Oil Joe – a former top ten finisher here … and he claims to put barb-e-que sauce on freaking everything. 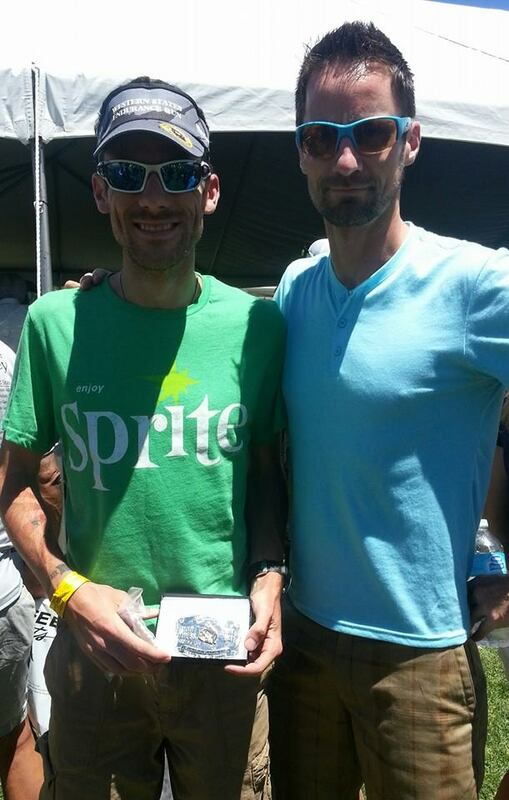 It’s his first 100 miler … with his wife Alicia this is Adam Condit from Cedar Rapids, IA. I now see even clearer the selfless and professional pacer I had in Joe as he peeled off the homestretch to allow Alicia and I to jog and walk hand-in-hand across the iconic finish line at Placer High School. I simply can’t express the sacrifice she’s paid to get me there … the finish line is as much hers as it is mine. “I don’t know exactly what to say because words aren’t enough. Words will never be enough. Only my life is enough as you’ve given me yours. You are giving me your life when you live through the puking, tired, growing, and beautiful months (like now) of pregnancy. You gave me your life through the labor of childbearing as I stood by only to be awestruck and receive. I could write more … I could. I could go on and on about this woman. Running 100 miles through the woods one time is laughable to what she grinds out as a stay-at-home mom day in and day out, week in and week out. Ok, but I’ll stop for now and hope you readers out there can see just a shred of what went into that finish line. I was dehydrated and out of sorts to tell her who she really is to me in those moments after I finished, but that’s ok. It’s kind of the point actually. Words aren’t enough. Only my life is enough. Hugs – first to Alicia and of course to Joe. What Joe did in the last 22 miles was essential to my finishing. I know him and his love for this race; he would rather be running the race himself to a certain extent, but if that were the case I think we still would’ve only had one buckle between the two of us for 2014 and it wouldn’t be mine. His struggle from last year, his crew, his experience, and his generosity were able to get me through. And boy was I glad to be done … to not think anymore. I think I was happier to be mentally done than physically. Weighing in again ~136.x lbs I was shot and had a stomach that didn’t feel like eating any time soon. 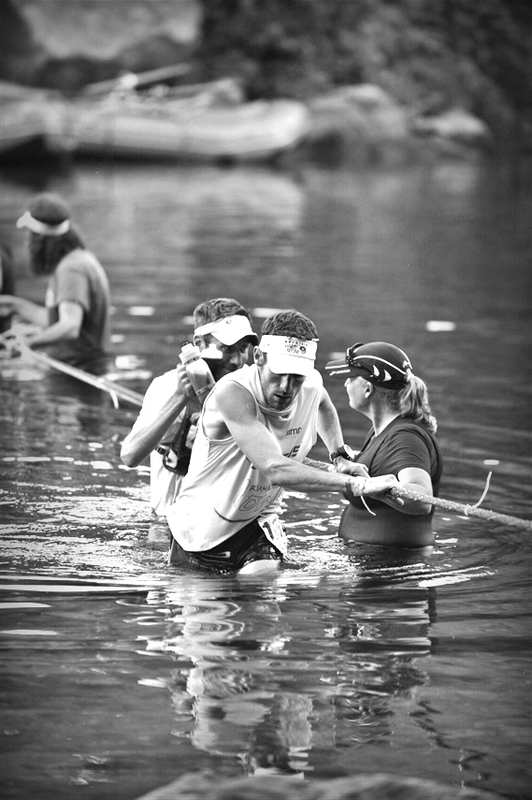 More hugs … crew members, extra long for my dad and mom despite probably smelling like I actually did die out there. Getting my normal post-ultra-race shakes and chills I hit the cot with some blankets, dozed off, sipped on broth, drank water, ~90 minutes later peed just fine, and went to bed at 4am at the hotel. 2 hours of sleep and I awoke hungry as a bear but with limited comfort in the stomach to really eat. Nauseous all day, especially in the sun, but finally a good night’s rest Sunday night (to relax in Napa Valley a couple days) before my stomach came back … and then. it. was. time. to. EEEEEEAAAAAAATTTTTTTTT!!!!!!! GET IN MY BELLY to anything and everything that whole next week. 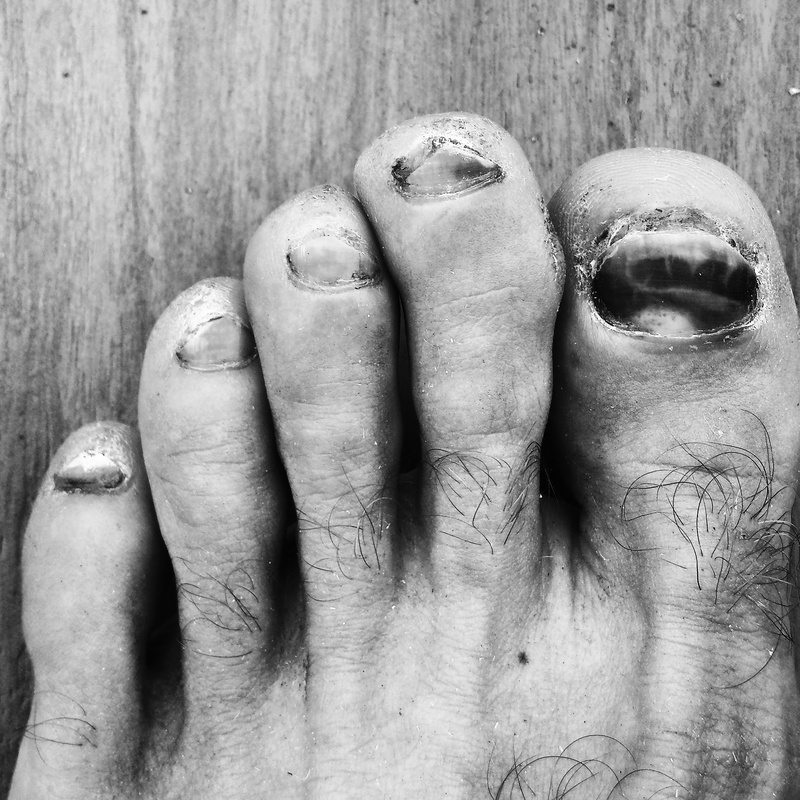 Looks worse than it is … feet were great all day!!! I am so incredibly happy with how this race turned out. Finishing was priority #1 and I’m happy to come home with a coveted 24-hour buckle. There are many more people not mentioned above that were unable to make the trip that I hold is such high regard. Most notably the whole off-site crew: my mom-and-dad-in-law taking care of our boys, Alicia’s other brother Justin and Jack / Jadia giving the most awesome pictures and drawings, and all extended aunts/uncles/cousins …. thanks for all you did and prepared beforehand! I peed twice within the first 20 miles than again at ~75 miles … never pooped. Nutrition / hydration was a bit on the low side probably all day … I underestimated the risk to become maybe a bit apathetic & lazy for on-the-run decision-making before it was a bit too late. I never changed shoes, socks, shirts, shorts, visor, main bottles, nothing. A tiny “hot spot” on each foot … no blisters that need to be popped, just one large dead toenail which became … more dead(?) and was easily ripped off as of yesterday. My gear was incredible. I’m 10 days out now and have had great recovery … legs / body feels no different than 50 mile race I’ve done – sore for 48 hours then dead-legs. Nothing nagging. Sadly, my nutrition / hydration was probably holding back my fitness potential … but again, finished and happy! I hope you realize by reading this that ultra-running is a team sport … I couldn’t have done it without my crew and pacers. These are incredible people and I know each runner out there also has their personal support crew without which none of it would all come together. Also a huge shout out to support from RunABlaze Iowa, SaltStick, Tiffosi Optics, and Simple Hydration for excellent sponsorship and great gear! I was reminded (once again) this past Sunday … we were given vast infinite appetites for greatness directly from God and trying to satisfy this hunger with anything but God leads to discontentment and unrest. It’s why some are driven to run 100 miles in the first place – because 26.2 miles or 50 miles doesn’t satisfy. It’s why some are driven to their 1000mi buckle (10x 100mi WS finishes), because one buckle doesn’t satisfy. It’s why some are driven to a degree of despair even when their goals are met … “I know I’d be happy if only I’d have knocked off another hour.” If I was top 20 instead of 43rd, THEN I’d be happy … no! No I wouldn’t. I’d be wondering how happy I would be if I was maybe top 10 or ran a steller time or had maybe been in the mix for the podium or X, Y, Z … it never ends because our appetite for greatness never ends – it is infinite. Let’s strive to put it in the only One who can satisfy … an infinite God whom we can place our security, significance, and pleasure in … our true and better identity. Let’s rest in Him and actually enjoy his gifts and blessing to work hard, train hard, race hard, feel His pleasure, yes, but not be identified by it. We can rest (in Him) and still train & race really really hard … or be legalistic, self-righteous, and appear not to care … it’s a heart issue. I believe He gave us running, He gave us mountains, He gave us music, He gave us theology, He gave us intellect, He gave us everything we have … but only for the sake of reflecting Him. He gives blessing but He also gives Himself. We should have the heart posture to hold with open hands and leave behind anything He asks us, anything that isn’t Him. To count it as loss if ever compared to or held up against Him. And by the way, He’s not asking me to completely leave behind and abandon running and count it loss (although He could at any moment) … I’ll be running. I still always see myself running and enjoying it … a lot. I’ll be around – maybe even up in the mountains again one day. Maybe with my boys and girls again. I don’t know. He does. Wow – 7500 words, thanks for sticking with me and reading to the end. 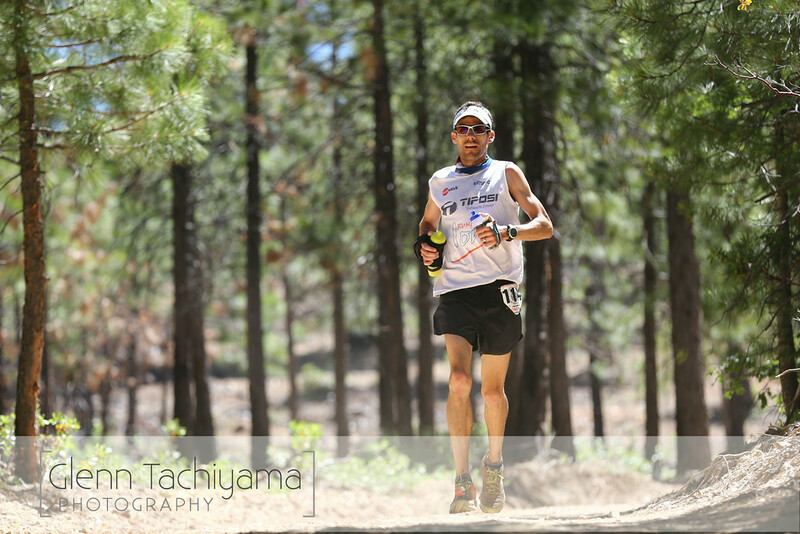 Feel free to share, laugh, mock, take communion, and/or go on about your day … or head over to my full Western States video and photo gallery here. Adam, I read your entire race report and it made my eyes well up on several occasions. I could sense the desire and passion you have for running, for life, for God and your family! I hope to one day meet you and say thank you for inspiring me! 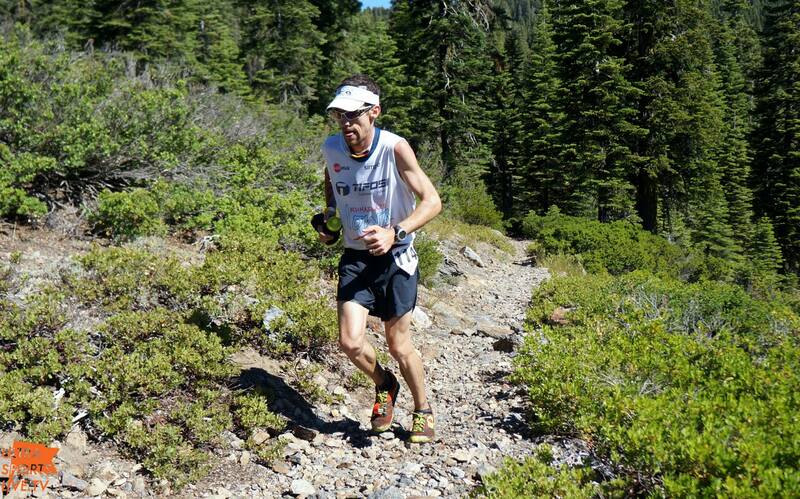 Congratulations on your WSER finish and for such a great write-up! Thanks for reading Mark – it’d be great to cross paths sometime! Wow! Amen, amen, amen! I read the whole thing, but what I got the most out of it was your love & passion for God! So well said and I might have to quote you, put some of this on my blog, because you so eloquently said what I have a hard time putting in to words myself, but it’s almost exactly how I feel. Although I am horribly guilty of feeling like I’ve not done enough in man’s eyes and letting that take over even when I know God holds my face in His hand each & every time and says with pride “well done”. And this is exactly the challenge I need as I am a month away from my next ultra…..training isn’t going too well and I’m already falling prey to thinking “it’s not enough….or if only training WAS going well, etc.”. I need to press forward & turn my focus on Him and let the rest fall in to place!!!! Hi Adam, Just came across your blog after seeing your Grand Canyon run which I went to as I ran down and up way back in 78′. Also, after getting back to running again and seeing some videos on Ultras it reminded of me of a goal I had many years ago of running WS. Not sure if it will happen but it is good to see others who have done so. It is even more enjoyable to see the outlook on the race you gave. Running in many ways is such a personal thing that it can lead one to become “me” centered and your focus on the team of people shows that the life God gives us is more than about us but about Him first and then about the people He places around us. I want to thank you for putting into perspective the race you did with what God has done and is doing. You are so right that regardless of how we do, and i have been running for a long time, we always have a tendency to not be satisfied and that is because the only thing we can be satisfied in is God. Thanks Tony! Running is (as all things are) from Him, through Him, and to Him. 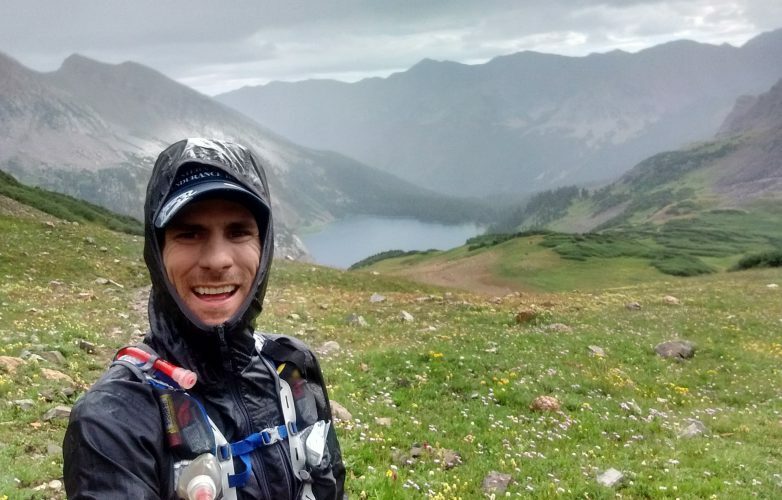 Thanks for sharing – glad you got to see the Grand Canyon and also – plenty of ways to be a part of WS each year besides running through pacing, volunteering, and spectating. Love that event / Saturday in June. Again thanks for the post and your focus on God. Keep training hard and smart and remember He who gives us strength (especially climbing Devil’s Thumb and in the night hours heading in and out of Brown’s Bar). Adam – I just finished your WS report and what a tale it was. Preparing for a hundo of my own in about 2 months, and I’m thankful to have found your post because it helps further remind me that what I do is a gift from God and is intended to reflect others to Him; not to myself. As a Christ-follower, I already knew this, but thanks mate for reminding me of it again! We all need reminding … I need it often. Have a great hundo!!! !